The local (California) team assembled the computer network, including the Inmarsat satellite terminals, and installed various software such as drivers for the Elecraft K3S radios. The work was directed by co-Organizer Rich KY6R, seen standing the far back. A schematic of the Atlas Cove, Heard Island local network. All the hardware was acquired, set up, and tested during this work session. The high-power WiFi will have a range sufficient to connect stations that might be separated by a half-mile, giving the team flexibility in locating the stations and antennas for best performance. Testing the N1MM logging software networks among the computers through the local HI WiFi, and its upload through the satellite to implement DXA. (front left to right) Matthison KJ6DZB, Dave K3EL, Carlos NP4IW, Jack K6JEB, and Peter W6DEI. (back left to right) Adam K2ARB, Jacob Brown, KC2OHR, Daniel WB4RFQ, and Mike KJ4Z. Sep. 12, 2015. On Saturday, the Diablo DX-ers (VKØEK California Support Team) and five VKØEK expedition team members assembled the hardware to implement the dataflow system required for the Heard Island expedition. The topology of the dataflow is described in the HI Newsletter #5. 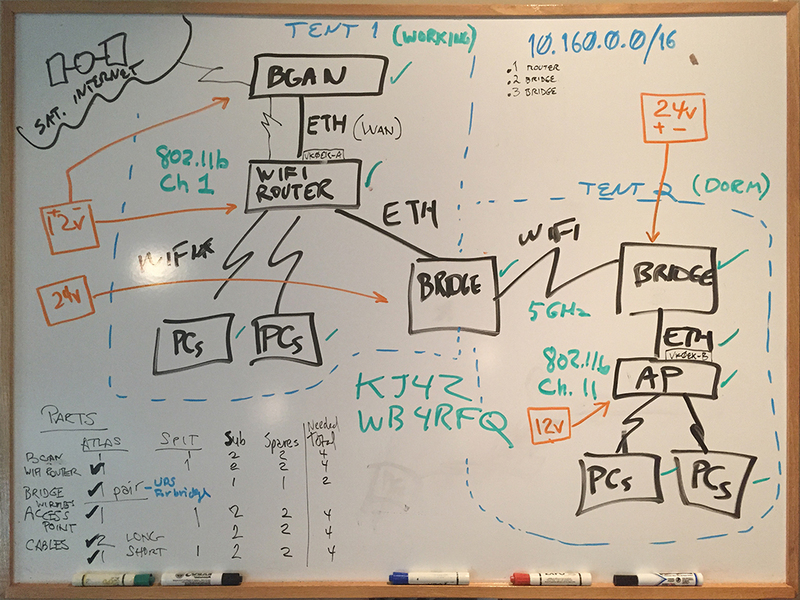 It is a complex system on the island involving 8 laptop computers, 8 Elecraft K3S radios, 3 WiFi networks in 2 locations, and 4 BGAN satellite terminals. During an intense work day, the team installed drivers for the new K3S radios, configured MMTTY, FLDigi, and QSO Order to all work with our N1MM+ logger. Rich KY6R, then led a demonstration with Pete W6OP on DXA emulating both Atlas and Spit, and a very successful day was then complete. The team made various important decisions about design and implementation of the system. For instance, there will be only one IP address, and only one computer will be a gateway to the satellite. It is safe to say that the VKØEK dataflow system will be among the most complex of any deployed on a major DXpedition. Of course, the highest priority is to make securely logged contacts with DXers, but it is also a major goal to provide this information in real time, to enhance the chances of DXers to get that QSO. The real-time operation does complicate the system, but it is our conviction that it is part of the future of DXpeditions. The support team was led by Rich KY6R, and included Mike KJ4Z, Peter W6DEI, Daniel WB4RFQ, Jack K6JEB, Elliot N6PF and Matthison, KJ6DZB. 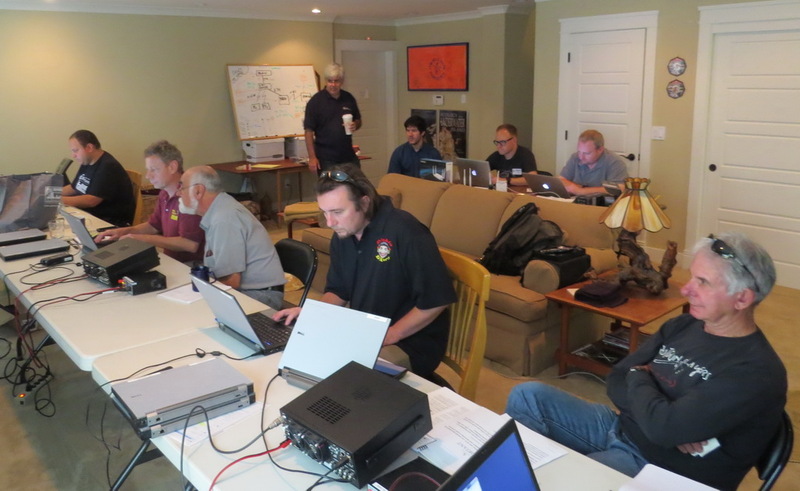 The onsite team included participants Adam K2ARB, Jacob, KC2OHR, Carlos NP4IW, Dave K3EL (radio team leader), and Bob KK6EK (expedition leader). By remote connection, Peter W6OP participated inthe tests, although he was traveling in Sicily at the time! 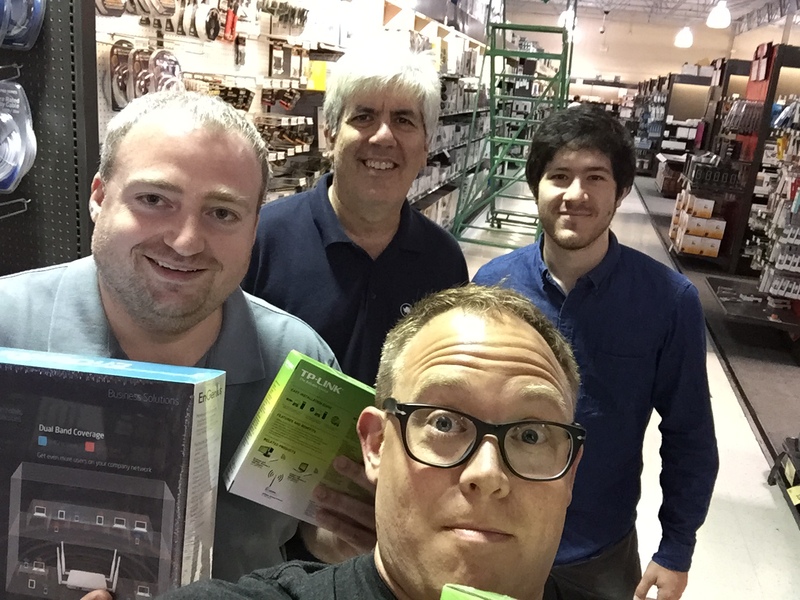 The team going shopping at Fry’s in Concord for some network “goodies”! ← Bob, KK6EK to Give a VK0EK Status Update Live on W5KUB / WTTW 5085 khz!